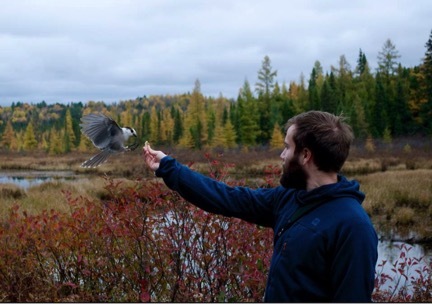 This week Dispatches from the Field welcomes Alex Sutton, a PhD candidate at the University of Guelph, Ontario, Canada to share his adventures chasing Canada Jays in the beautiful Algonquin Park. For more about Alex, check out his bio at the end of this post! One of the things I enjoy most about field work is being immersed in an environment every day, and, as a result, having the opportunity to see things that many others do not get to experience. Over the past four years I have been lucky enough to spend countless months following Canada jays (formerly known as gray jays) throughout Algonquin Provincial Park in central Ontario. Russ Rutter, a former chief park naturalist, first started studying Canada jays in Algonquin in 1964. He was interested in understanding the natural history of this fascinating bird and was one of the first people to use colour-bands as a way to follow individuals throughout their lifetime. After he retired from the park, Dan Strickland, another former chief park naturalist, continued studying the jays, following them throughout the year and collecting information about their nesting behaviour for over 40 years! This long-term dataset has allowed us to track how the population of Canada jays in Algonquin Park has changed over the last 54 years. Unfortunately, since the 1980’s we have observed a decline of over 50%. The Algonquin population appears to be experiencing more severe declines than other Canada jay populations, which may be because Algonquin Park is at the southern edge of the Canada jay’s range in Ontario. Understanding the drivers of this population decline, the main focus of my PhD research, will hopefully allow us to predict how other populations may respond to climate change. To figure out what factors are causing the Algonquin population to decline, we need to follow Canada jays throughout the entire year. In autumn, while enjoying the beautiful fall colours of maples and tamaracks, we determine which territories are occupied and which individuals are present on a given territory. The autumn is an important time of year for a Canada jay because during this time they begin caching food that they will rely on throughout the winter for survival and reproduction. Amazingly, one Canada jay can make thousands of food caches in a day and return to these caches months later! Throughout the autumn, jays will actively seek out humans because they see humans as a good source of food, making it one of the best times to see them (and their colour bands!). After determining which territories are occupied, we return in the winter to begin monitoring each pair throughout the breeding season. Unlike most other Canadian songbirds, Canada jays begin building nets in late February. This means that for most of the breeding season I travel through the landscape on snowshoes and have to bundle up to brave temperatures as low as -30°C! But despite the cold, there are few things as rewarding as finding jay nests. Sometimes it can take weeks to find a single nest, and it often requires some imaginative use of natural features like beaver dams to avoid getting soakers (when your boots fill with water) in the sub-zero temperatures. As winter slowly becomes spring, eggs that have been incubated through freezing temperatures and snowstorms begin to hatch. Once the eggs hatch, we monitor each nest for about two weeks before we return one last time to band the nestlings. 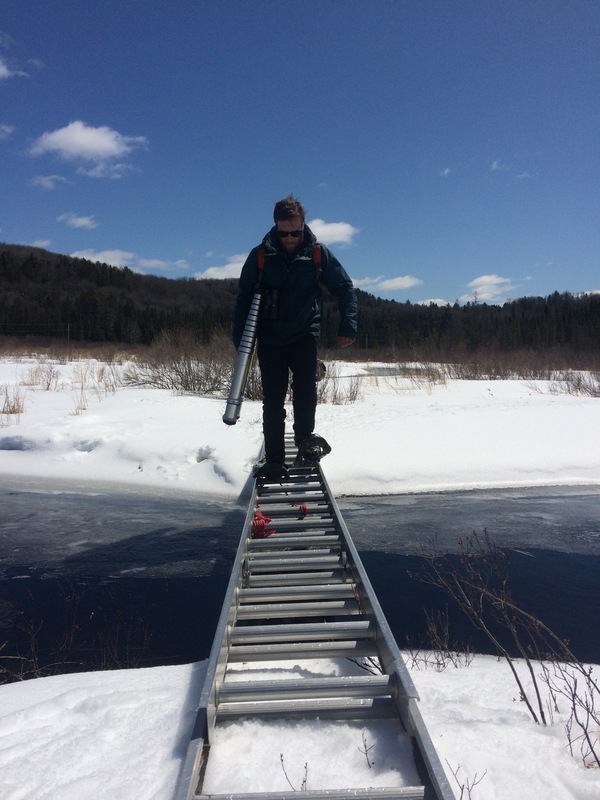 We typically carry ladders through the forest and sometimes across frozen rivers to each nest tree. Once the ladder is in place, we carefully scamper up the rungs to collect the nestlings for banding. 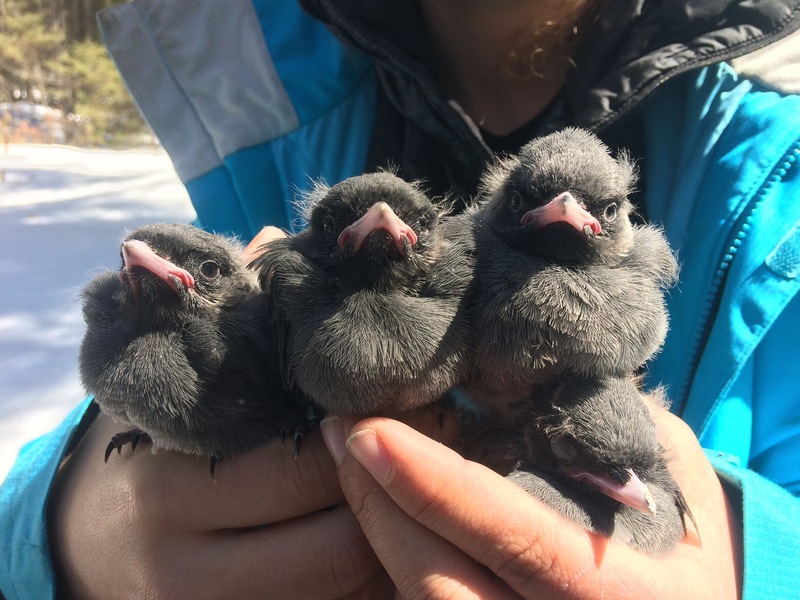 This is one of the most rewarding parts of the field season, because all the hard work we have put into finding and monitoring each nest has finally paid off with the sight of several fluffy Canada jay nestlings trying their best to emulate Einstein’s signature hair-do. One of my fondest memories of my time in Algonquin is of banding a nest last spring. The adults were circling around us while we banded their young and the male had a full mouth of food he was bringing back for the nestlings. As he got closer, my colleague held up the nestling being banded. Remarkably, he landed on my colleague’s hand and fed the nestling right then and there! This was the first time I had ever seen something like this and I will remember that moment forever! (Video of this encounter here). As spring turns into summer, the young Canada jays begin to fledge from their nests – and my fieldwork continues, as we follow the dispersing fledglings. Beginning in May, I and another PhD student, Koley Freeman, track radio-tagged juveniles while they move around their natal territories. Each radio tag ‘backpack’ emits a unique frequency and allows us to track down birds, even when we cannot see or hear them. After about six weeks, these juveniles start to leave their parent’s territories and disperse across the vast Algonquin landscape. These young birds can travel over 15 km, so to follow them, we need to track them from the air! 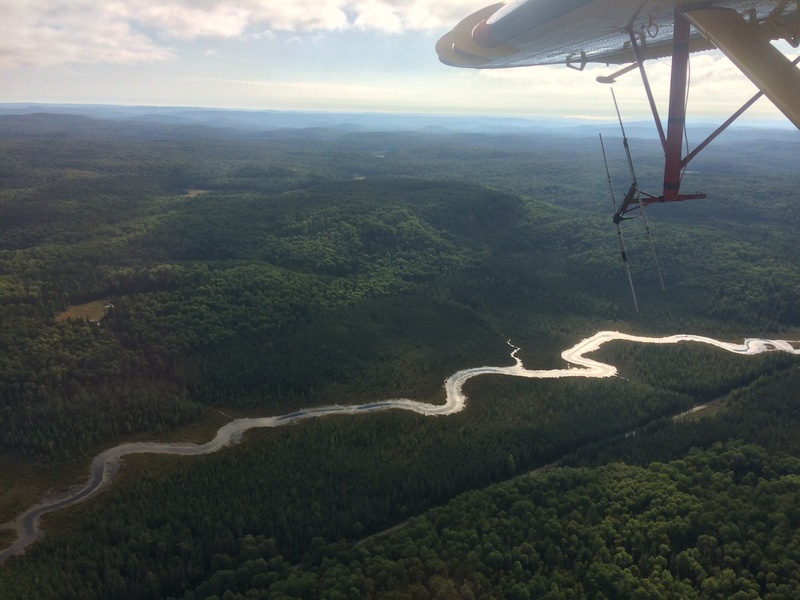 Being in a plane flying over my study area provides a great perspective of the vastness of the landscape and gives me a new appreciation of how diverse Algonquin is. Each year in Algonquin has been an exciting experience that has taught me something new. With each passing field season, I learn more about the jays and how they cope with the ever-changing environment. Canada jays are resilient enough to survive harsh boreal winters throughout North America, but climate change is wreaking havoc on their breeding success. Changing fall conditions negatively influence their cached food, contributing to the record low number of nestlings produced that I have observed over the course of the last three field seasons. I am lucky to have called Algonquin a home away from home for the past four years, and had so many great experiences in the park. I would like to thank Dan Strickland, all the staff of Algonquin Provincial Park, the Ministry of Natural Resources, the Algonquin Wildlife Research Station, and my partner in crime Koley Freeman for helping with field work and making every day in the field more exciting than the last. For me, the joy of fieldwork comes not only from pushing yourself to learn from and about your study species, but also learning to appreciate the beautiful places that this work can take you. I will always remember the sights and sounds of Algonquin, the Canada jays, and the unexpected experiences I have had over the course of the last four years of fieldwork. Alex Sutton is a PhD Candidate at the University of Guelph. During his undergraduate degree, he worked throughout North and Central America studying the population ecology and habitat use of migratory songbirds. If you would like to keep up with his ongoing research follow him on Twitter @Alexsutto. 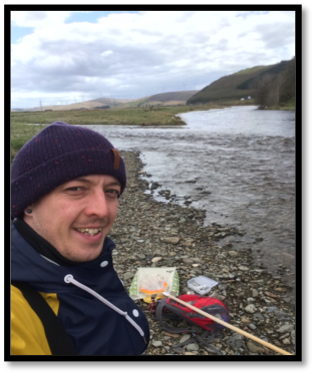 This week on Dispatches of the Field, we welcome Larissa Simulik to share her story of conducting bird surveys in Scotland – sheep and all! For more about Larissa check out her bio at the end of the post. The beauty of field work is getting to travel and work/live in some of the most unique places in the world. An example of this was the time I spent working as a seasonal assistant warden at the North Ronaldsay Bird Observatory. 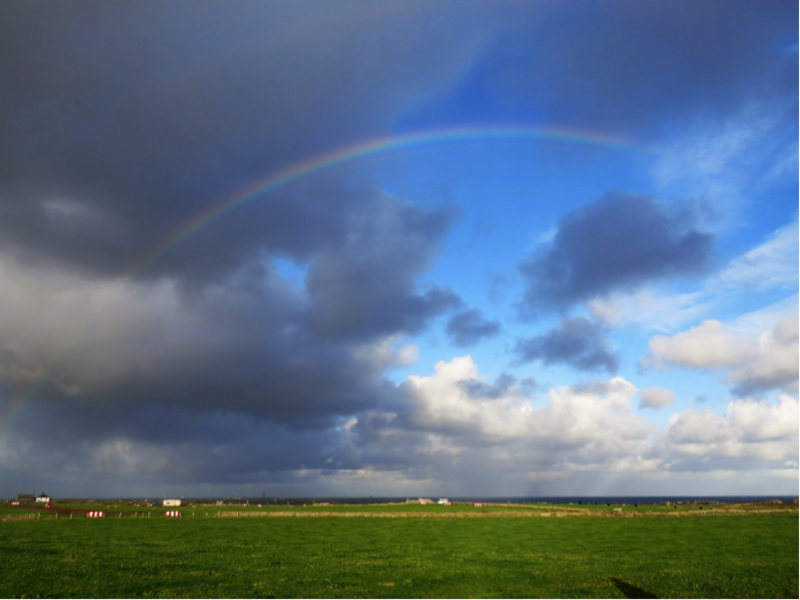 North Ronaldsay is the northernmost island in the Orkney archipelago, off the northern tip of Scotland. It is a small island (roughly 4.5 km in length), with a population of ca. 45 people and almost no trees. This was a bit of a shock for me, having previously lived in Nova Scotia with its beautiful forests! Conducting bird surveys in North Ronaldsay proved to be very different from what I was used to. Nice part about being on an island is seeing the incoming rain. For starters, I was (and still am) a decent birder when it comes to North American birds: I can identify about 80% of the birds I come across in Canada. But identifying European birds was a completely new story. Warblers in Europe are not bright and colourful, like their North American counterparts. Instead, they are simply different shades of brown (eg. the Acrocephalus genus). And the warblers were not the only family that posed an identification challenge when I started at North Ronaldsay, as the island hosts many bird groups ranging from waterfowl to seabirds. Prior to my stay I had little practice identifying shorebirds, but as I needed to count flocks containing hundreds of birds of different species, I had to learn how to tell the difference between a dunlin and purple sandpiper quite quickly. 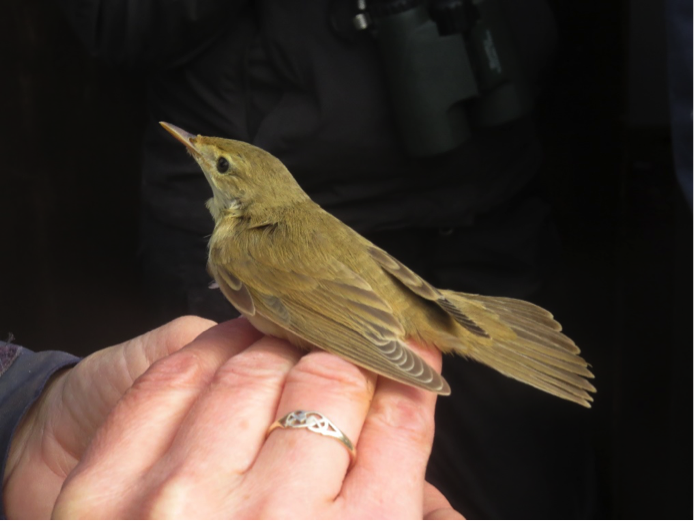 Great example of a European brown warbler – a marsh warbler! Since my part of my job entailed conducting regular censuses of the birds on the island, persistence and patience were key to my success. I never left the observatory without “The complete guide to the birds of Europe” in my backpack. I used the guide so much that by the end of the season it was pretty much destroyed. (Granted, though, this was at least partly due to the amount of water damage it received when I got caught in the frequent rainstorms!) I was also fortunate to have some visiting birders come out on census with me, to provide help with my bird identification. A big shout out here to Ade Cooper and Gary Prescott (current world record holder for greatest number of birds seen by bike in a single year) for heading out with me and giving me tips on how to identify tricky species. North Ronaldsay itself was very different from the forests of Ontario or Nova Scotia. The landscape was filled with rocky shorelines, grassy fields, and coastal heathland. Unlike Canada, forest breeding birds on their northward spring migration to Scandinavia could be found along stonewalls and in grassy fields. This made finding birds difficult: I had to walk along almost every stonewall and through each field to see if any birds were hiding in the long grass, iris beds or weedy crop. 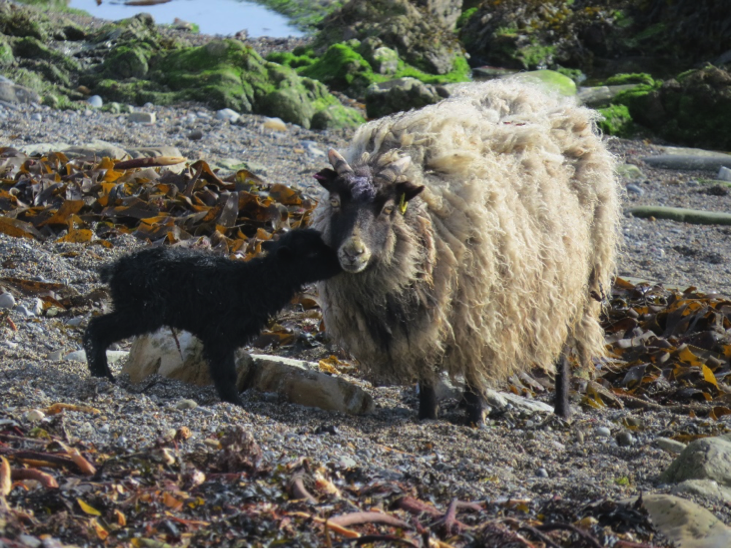 North Ronaldsay is known for its feral sheep, which live on the shoreline and eat seaweed. It was a weird experience to be counting shorebirds along a rocky coast with common and grey seals sunbathing on one side and sheep eating seaweed on the other side. The sheep could also be a bit of a nuisance, as they would sometimes run right past me and scare off all the birds I was counting. I distinctly remember the time I sat down on a rock to count some long-tailed ducks just offshore – and suddenly a curious sheep stuck its face in front of my binoculars! The famous seaweed eating sheep. As a seasonal assistant warden, I had the opportunity to conduct some independent breeding surveys. My first survey, and the one that was closest to my heart, focused on the productivity and habitat preference of northern fulmars on the island. I surveyed the entire island on my own, using a GPS to mark the location of each nest…all 630 of them! It was an exhausting few days. On top of that, working with the fulmar chicks was a bit of a challenge, as their defense mechanism is to projectile vomit on any intruders. I learned the hard way not to point them into the wind when handling them! My second survey focused on the productivity of the arctic terns. Originally, I intended to ask whether colony density was related to productivity. However, due to some nasty weather at the end of June, the majority of colonies failed. As a result, I changed my plan, focusing instead on measuring productivity across each colony and creating a baseline survey technique for use in future years. Fulmars are normally cliff breeders – I don’t understand the logic behind this nest. 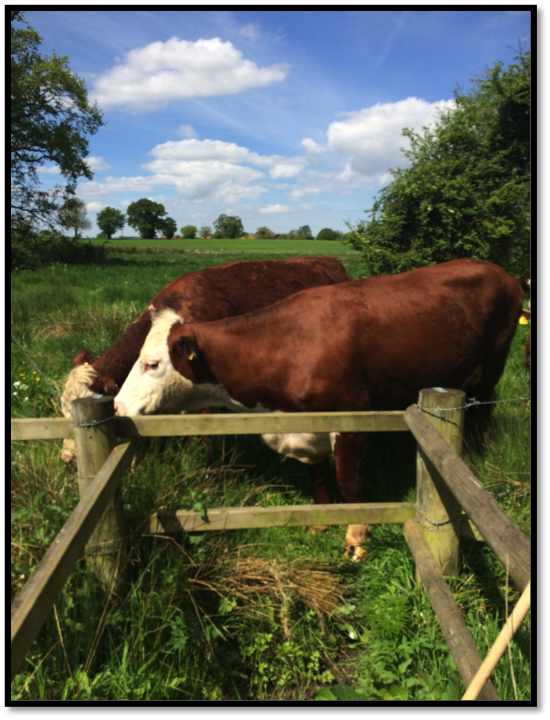 Undertaking these breeding surveys taught me about the struggles of conducting research on my own with limited resources. Furthermore, during the write-up process, I realized how hard it is to access research papers or journals for anyone who isn’t affiliated with a university or organization. But overall, working at North Ronaldsay Bird Observatory was a great experience! I have so many more experiences I could write about…but if I did, this post would go on for far too long. I will say that if you ever have the chance to do field work in another country, I would highly recommend it. 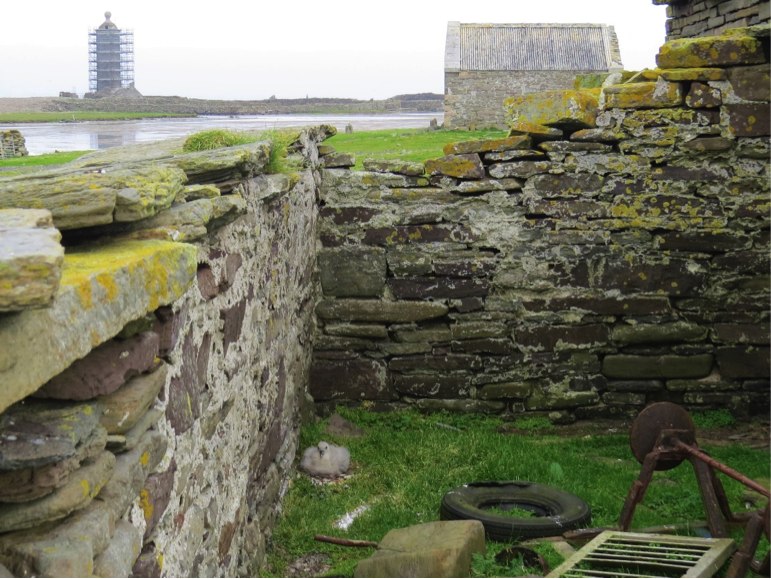 I doubt I will ever get to work in a place as unique as North Ronaldsay again…but on the bright side, at least I won’t have to worry about beach-dwelling sheep interrupting when I’m counting birds! Larissa received her Bachelor of Science in biology from Dalhousie University in 2016. Her undergraduate honours thesis focused on begging call structure and stress levels in tree swallow nestlings. She has worked on projects ranging from forest birds at risk conservation to wildlife disease surveillance. Next year she will be heading to Sweden to work as a field technician at Ottenby Bird Observatory. This week, Dispatches is excited to welcome a good friend of ours, Lauren Meads. 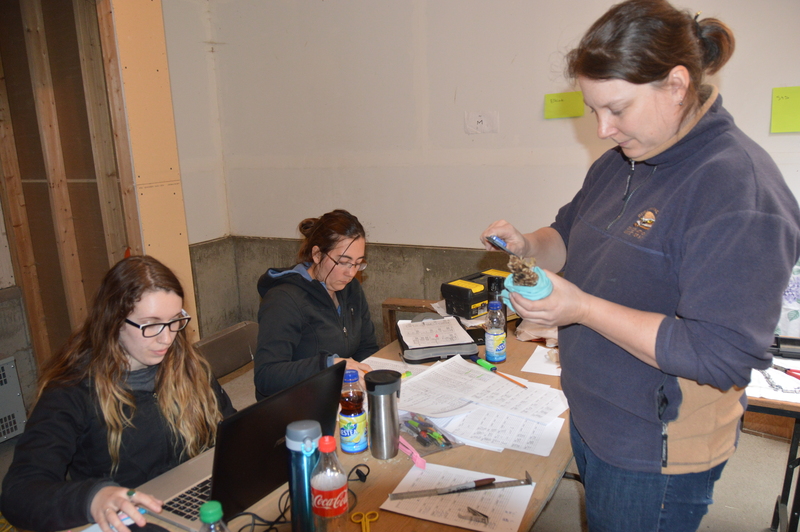 Lauren is the Executive Director of the Burrowing Owl Conservation Society of BC – and is in the enviable position of working with some of the most charismatic (micro)fauna around. For more about Lauren and the BOCSBC, check out the bio at the end of the post. As the Executive Director of the Burrowing Owl Conservation Society of British Columbia, I’m often asked how I wound up working in this field. I don’t have a simple answer. My path to this career — which I love — has been somewhat meandering. And honestly… birds?! I never thought in a million years that my passion for birds, specifically owls, would be such an important part of my life. I’ve always loved animals and growing up had dreams of being a zookeeper. This led me to an undergraduate degree in Biology and then an internship working with exotic cats in the US. To further my career, I went back to school for my master’s degree in Applied Animal Behaviour and Welfare at the University of Edinburgh. My first job after finishing that program was at a zoo that focused on conservation, which drew me into the world of breeding animals for the purpose of reintroduction into the wild. My expertise in working with mammalian carnivores led me to working with raptors. And from there, I found myself working on the beginnings of the Northern Spotted Owl breeding program in BC. Remember how I said the route was meandering? Well, after two years working with spotted owls, I decided it was time to move on to another job. During a co-op placement in my undergraduate degree, I had dabbled a bit in lab animal work and I decided to give that a try again. This was a short-lived decision, as I quickly realized that world was not for me. I longed to get back into conservation and working in the wild. Luckily, I had kept in contact with my colleagues from the Northern Spotted Owl project. 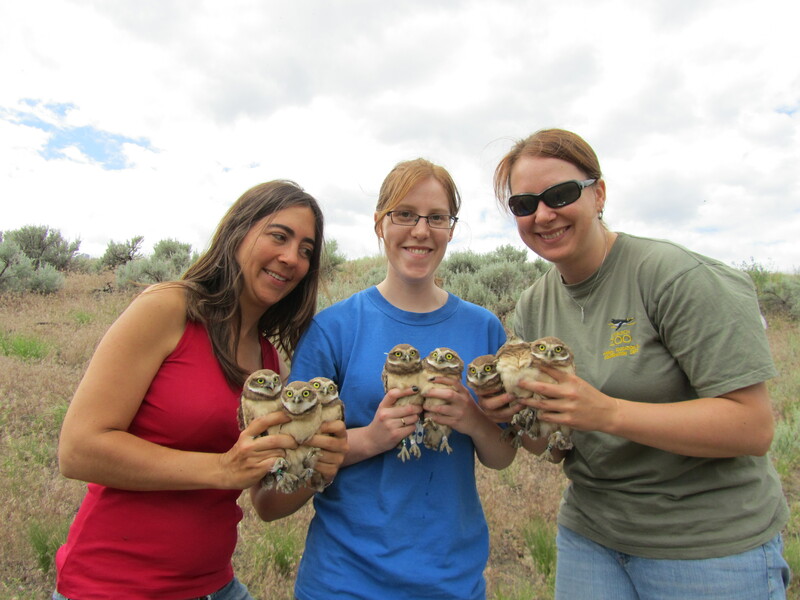 When I reached out to them, they alerted me to an opportunity to work in the field with burrowing owls. That was ten years ago, in 2008. And ever since then, I have been deeply involved with burrowing owls. 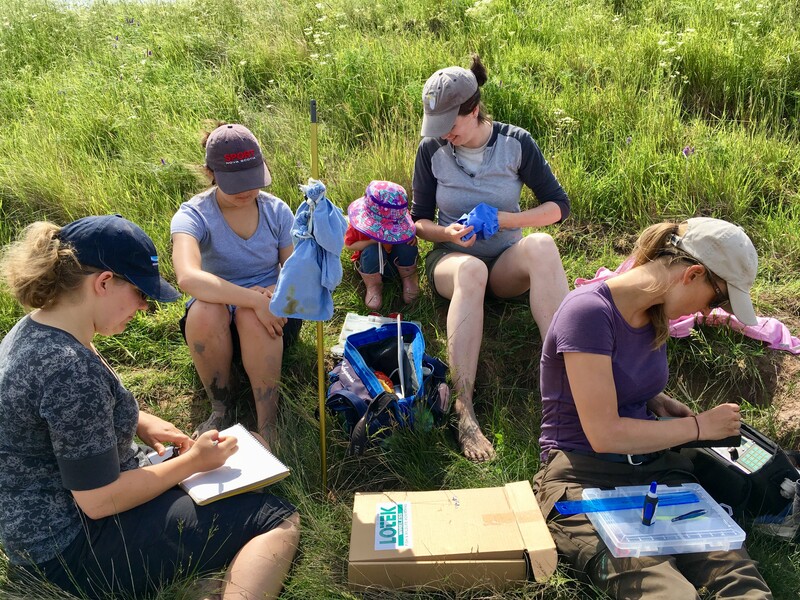 First volunteering, and then working in the field monitoring releases, and now overseeing the breeding and reintroduction of a native grassland species throughout British Columbia. As you can tell by the length of time I’ve been working at this job, I finally found my calling working with the Western Burrowing Owl (Athene cunicularia hypugaea). I fell in love with burrowing owls as soon as I started working with them. I love how unusual they are among owls. While they do fly, like all owls, they also spend a lot of time on the ground hunting and roosting. They nest underground and are active during both day and night. Unfortunately, burrowing owls are also currently threatened across North America, and endangered in Canada. Populations in Manitoba have been extirpated, while in Alberta and Saskatchewan they continue to decline. And where I work, in British Columbia, burrowing owls have been extirpated since the 1980s. While the causes of these dramatic population declines are complex, we do know that losses of burrowing mammals, such as badgers, have played a major role in the owls’ decline. Despite their name, burrowing owls don’t excavate their own burrows, but instead use those abandoned by other animals – so without animals like badgers, they have nowhere to nest. Other issues facing the owls include pesticides, increases in populations of aerial predators such as red-tailed hawks and great horned owls, road construction, and climate change. Conservation efforts are underway in all four Canadian provinces, as well as several places in the States. In 1990, volunteers in British Columbia initiated a comprehensive re-introduction program, including three captive breeding facilities, artificial burrow networks and field monitoring research. 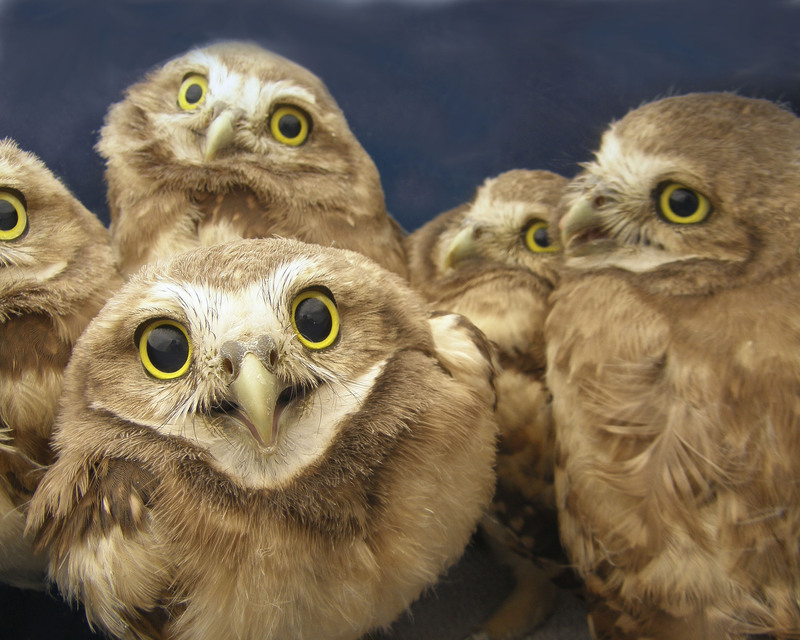 The Burrowing Owl Conservation Society of BC (formed in 2000) produces over 100 owls each year to release in the Thompson-Nicola and South Okanagan grasslands of BC. In recent years, improved release techniques have resulted in higher adult survival and greater numbers of wild-hatched offspring with the potential to return in following years. What my work looks like varies greatly depending on the season. Right now, in winter, I’m busy with the joys of writing reports and grant applications, as well as fixing the breeding facilities, installing artificial burrows in the field, and providing outreach to the public. Come spring, I and a field assistant (more than one, if funding is good! ), plus some dedicated volunteers, will check each of the ~600 active burrows across our field sites. Our task is to check each one for owls returning from migration, and to ensure the burrow is in good working condition. In April, we will take the 100 owls bred in our facilities and release them into our artificial burrows. We have placed these burrows on private ranches, land owned by NGOs, Indigenous band lands, and provincial parks. This work requires a LOT of driving — sometimes up to 3-5 hours per day as we go from site to site. After the release, we continually monitor the nesting attempts of the released owls, as well as those returning from migration, and provide supplemental food to help them raise their chicks. Along the way, we band the young born in the field. We monitor them until they all leave in September and October to head south. Where exactly the owls go during the winter is still something of a mystery. We sometimes get reports of sightings of our banded owls, and we also get data from groups in the US and elsewhere in Canada that have deployed satellite tags. (We’d love to use satellite tracking tags ourselves, but they are expensive, and our organization runs on limited funds!) Based on the information we’ve received, we know that BC owls have been seen throughout the western United States, and most likely spend the winter in Mexico. Recent years have seen an increase in the number of owls that return to BC in the spring; however, currently we still don’t have a self sustaining population. Our next step is to work on understanding the owls’ migration movements, and determine ways to increase survivability. This will involve working across Canada and internationally. Something else I’m often asked is what the next steps are for burrowing owl conservation. Unfortunately, there’s no easy answer to this question either. While there are many organizations dedicated to conserving these unique owls, they all run on limited funds and resources. BOCSBC uses almost all of its funding breeding and releasing owls, as well as creating and maintaining the artificial burrows they use. Certainly, this is essential for the species’ recovery, but we also need to tackle the many unanswered questions about the causes of their decline before we can hope to reverse it. At the moment, there’s still so much information we’re lacking, including where the birds’ winter, issues of migratory connectivity, changes in prey availability and shifts in climate across their range. 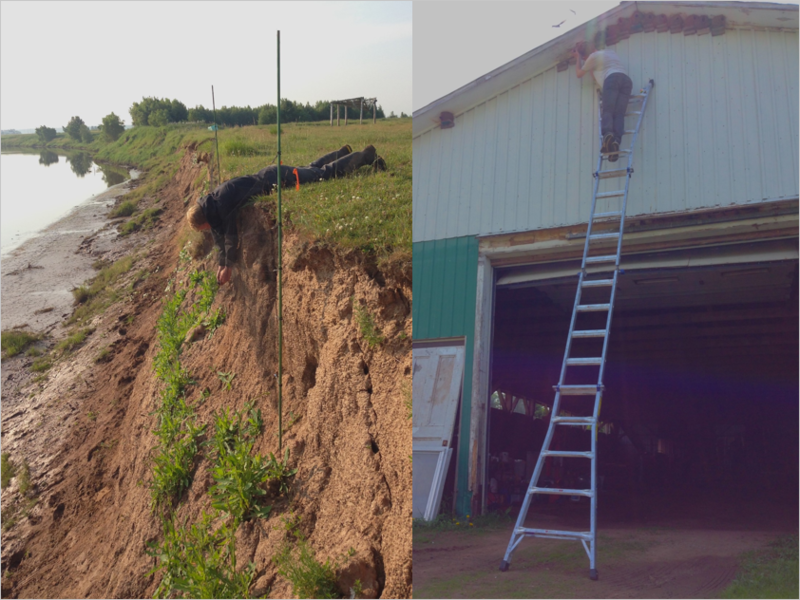 The path that brought me to working in burrowing owl conservation was unconventional. But ten years into this career, there’s nowhere else I’d rather be! 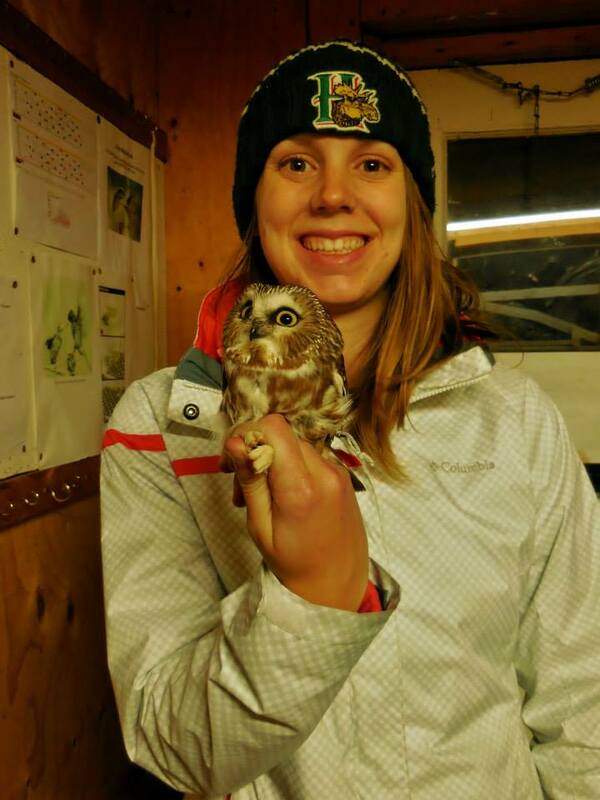 Lauren Meads is the Executive Director of the Burrowing Owl Conservation Society of BC. She has worked with owls for over 10 years, although she still has a passion cats both big and small. She lives in the South Okanagan Valley in BC with her husband Tim and their three (small) cats. To learn more about the ongoing effort to reintroduce burrowing owls in BC, check out this video from Wild Lens. If you are interested in helping out with this project, you can contact the Burrowing Owl Conservation Society of BC at bocsbc@gmail.com or donate via Canada Helps. This week on Dispatches from the field, we wanted to highlight a really cool site called Faces of Fieldwork (http://facesoffieldwork.com/). With a tagline of “Scientists are people too. 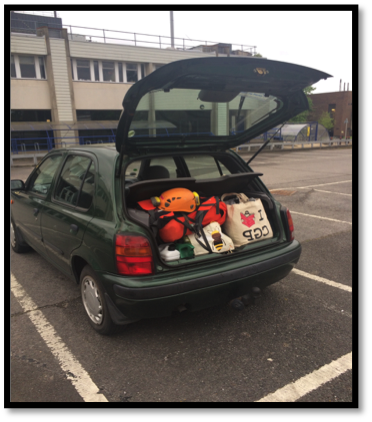 We show the personal side of scientific fieldwork” how could we resist? Using pictures, they highlight what it is really like to do fieldwork from different fields all over the world. You’ll find pictures that make you say “aww”, “ouch”, “what?”, “cool”, and “no way!”. Check out their site to submit your own photo and follow them on twitter: @facesfieldwork! Here are just a few examples of Faces of Fieldwork. Make sure you go to the site to read about them! For my first time on the west coast of Canada for fieldwork I wanted to make sure I was prepared for the dreary, cold, and wet type of weather I was likely to encounter…but some might say I was overprepared. 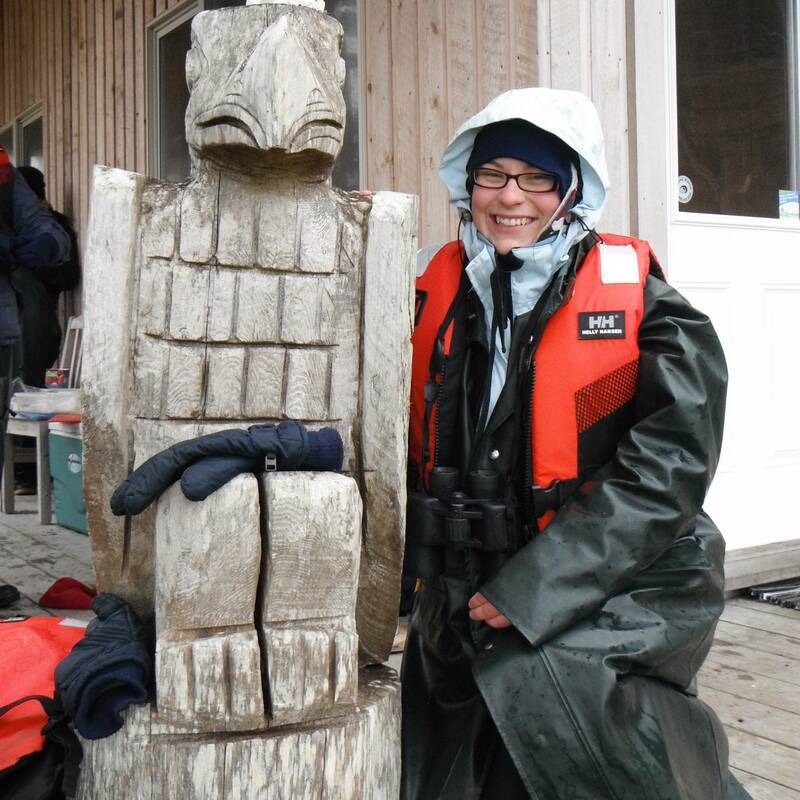 This is a picture of me on my first day: I was wearing two pairs of socks, rain boots, two pairs of pants, rain pants, 3 shirts, a rain coat, a thicker rain over jacket (of heavy plastic), a toque, mitts, and a lifejacket (safety first!). The layers weren’t very useful for traversing remote islands looking for seabirds so inevitably they had to come off! Read more about my fieldwork on my blog! 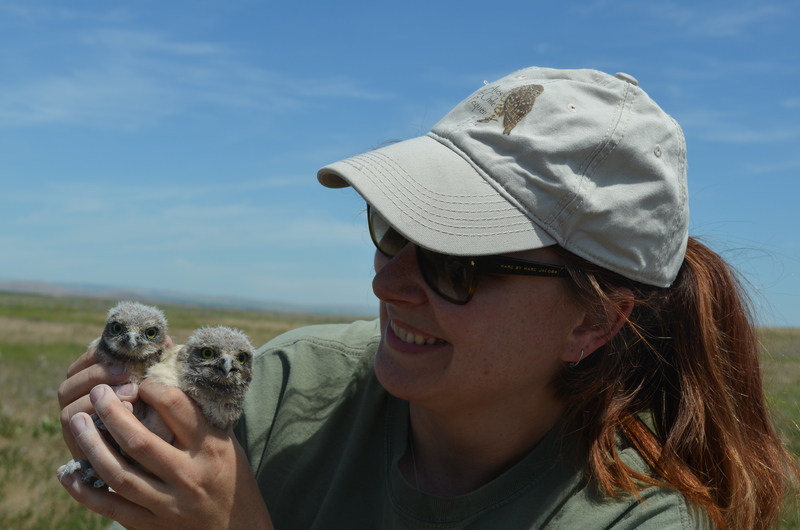 This week, Dispatches from the Field welcomes Dr. Tara Imlay, a recent PhD graduate, swallow conservation expert, and parent. In her post, Tara shares some of the challenges of this kind of multi-tasking – as well as some of its rewards. For more about Tara, see her bio at the end of the post. Just call me Dr. Mama… after all, my precocious nearly three-year-old does. Field work was one of my primary considerations when I chose to have a baby during my doctoral degree. Specifically, I wanted to avoid being in the third trimester during my second field season, and I wanted the baby to be at least six months old during my third field season. As you can imagine, that left a very small window in which to get pregnant. Luckily, for me, that wasn’t a big challenge. Instead, the challenges during my second field season came in the form of prolonged morning sickness, food aversions, exhaustion, and changes to my centre of gravity. The latter landed me in the hospital after I fell over a bank one morning while mist-netting Bank Swallows. Luckily, no one was seriously injured – and one of my field assistants now has an amazing response to any interview questions about dealing with unexpected problems in the field! After that experience, though, I began delegating a lot more field work to my assistants, especially anything involving heights. Danny demonstrating safe ways to remove Bank Swallows from mist-nets, and check Cliff Swallow nests. The challenges in my third field season came in the form of exhaustion from lack of sleep. At that time, Robin* was still waking up routinely through the night for feedings. On numerous nights, she was up at 11, again at 2, and my alarm would go off at 3. Honestly, I don’t remember a lot of the details of that field season, but somehow we managed to get everything done. But despite the challenges, there were a lot of amazing moments during those field seasons and the field seasons since. Moments like sitting in the field banding birds, with a very chubby baby propped up beside me. Or watching how excited she got over seeing all the birds, cows, sheep, dogs, and anything else that moved at my field sites. 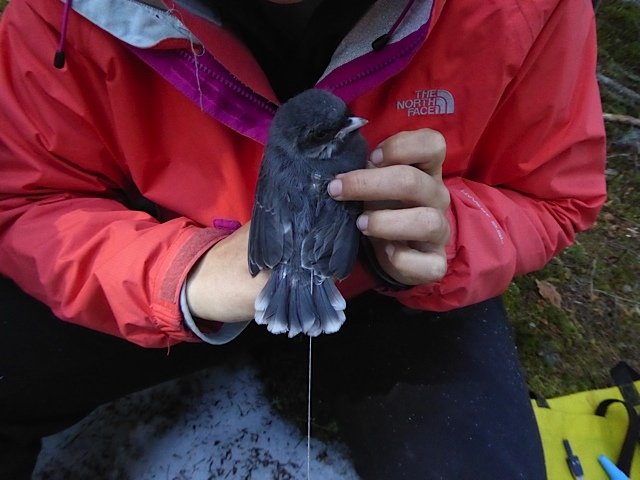 This past year, she’s taken on a more helpful bent in the field: carrying equipment, checking swallow nests, and, her favourite task of all… getting to let birds go after they’ve been captured and banded. The field team, including its smallest member, busy tagging captured Bank Swallows. This doesn’t mean everything is perfect. Sometimes, it’s a challenge to manage her short attention spans, and I can’t always bring her with me when I’m in the field. Luckily, I’ve had the opportunity to work with several great people who don’t mind helping out with an inquisitive child, when needed. But despite the challenges, having a baby during my PhD didn’t affect my ability to finish my degree, and hasn’t stopped me from pursuing other opportunities, both in and out of the field. Becoming a parent with a busy field schedule isn’t a common occurrence, but if it’s something you want, then you just have to go for it, deal with the challenges as they come, and enjoy the special moments along the way. *Her middle name, for anonymity when she’s older. Tara Imlay is a recent PhD graduate from Dalhousie University. 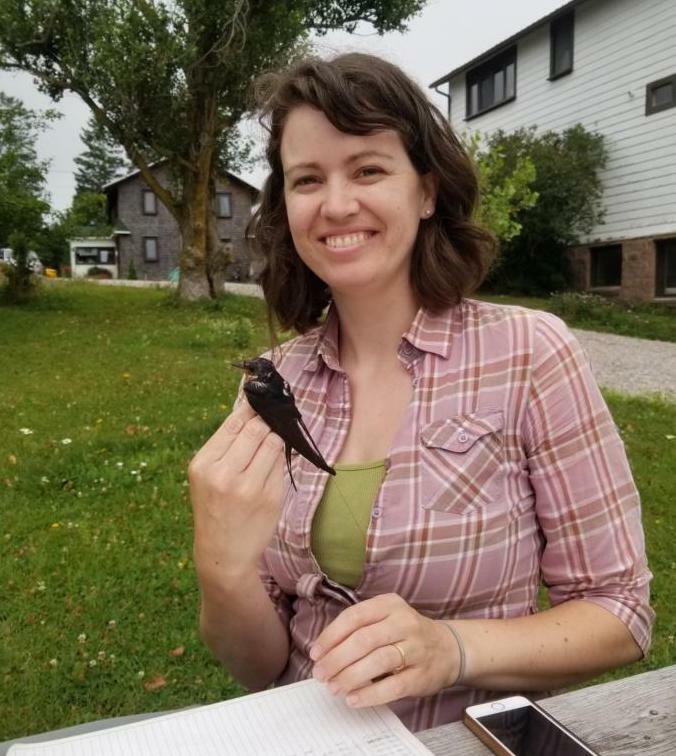 Her PhD and postdoctoral work focuses on the ecology and conservation of four species of swallows throughout their annual cycle. Prior to pursuing her PhD, she worked on various conservation programs for birds and reptiles in Canada, the USA and Mauritius.